Stephanie is the Director of Training and Consulting at Kolbe Corporation and has been involved in recruiting and coaching for many years. She has worked at Intel, Deloitte and Cisco, and holds an Industrial Engineering degree from Stanford. She is also an accomplished Vampire and Zombie Killer, a.k.a. the Walking Working Dead who prefer to stab someone in the back to get ahead, and the Energy Suckers who do as little as possible to get through the day. She tells it like it is, and has some great suggestions for job seekers. To view the slides for this presentation, click here. 3. Conative (doing): ease, energy and excellence. 1. Define your strong career: ask yourself when you loved what you did, who you worked with and where you were (i.e. culture/industry). Your hobbies, internships, volunteering activities and side hustles can tell you a lot about what you love, not just your prior positions. *Your resume tells the story of where you’ve been as well as where you want to go. If you’re looking to change careers but you have no history in the industry you want to be in, get some history by volunteering or getting an internship. *LinkedIn is a must. Your profile should be at 100%. Get good recommendations that tell specifically why you were good at what you did. Remember that your entire profile is searchable, so be careful what information you put on it. You may or may not want your telephone number, and be careful about which groups you belong to. *Questions are also a must. They show you’ve done your research on the company/position and can provide additional clarification on anything said at the interview. Stephanie didn’t hire a candidate once because the person had no questions for her. Personally, I’ve never gone into an interview with less than 10-15 questions at the ready. *Stories are preparation for behavioral questions at interviews. Be clear about what you contributed and how it impacted the organization. Also be prepared to explain everything on your resume, as well as any gaps. Work your plan: What are your daily or weekly steps to accomplish your goal of getting hired at a place and position that’s right for you? One bullet point should be going to one networking event per week to get yourself out there, because you never know who you will meet and what that meeting might lead to. Northwestern Mutual has been around since 1857, and is the second largest broker dealer in the US. Northwestern is not a publicly traded company. They believe in “impacting lives with great purpose,” so they consider the following to be very important: family, faith, abundance, personal responsibility and passion. If you are ambitious, like to meet people and help them, Northwestern wants to talk to you. Current opportunities include Financial Advisor and Assistant Financial Representative. There are also staff opportunities available via the corporate website. Cox Communications is only one segment of Cox Enterprises. Cox Communications is the third largest cable company in the US, which introduced Contour and GigaBlast, the highest internet speed available. There are many benefits for Cox employees who contribute to Cox’s culture of success, such as the Compass program. Cox takes community participation seriously, so there are always volunteer opportunities available. Cox is looking for direct sales people, as well as account managers for different segments. Rogers Corporation was founded in 1832 by Peter Rogers. They recently moved their corporate headquarters to Chandler and are looking to fill various positions throughout the organization. These include Business Analyst, Accountant, Project Engineer (Facilities), LMS Administrator, Quality Engineer, Process Engineer, Strategic Project Manager, Corporate Controller, Executive Assistant, Accounts Payable/Accounts Receivable, Demand Planner and Global Health & Safety Manager. Safety is their number one priority, and integrity is their base. Rogers has approximately 3000 employees worldwide. Freedom Financial Network is a debt consulting company that provides financial solutions and services to enable consumers to achieve financial freedom. Their 3 AZ locations have 1300 employees, and have hired 200 of the 1000 individuals they want to hire this year. They are in the process of building a new campus in Tempe and were recently named as a Phoenix Business Journal “Best Places to Work” Winner. Open positions in Tempe include Java Developers, Product Managers, Corporate Trainer, Compliance Manager, Business Intelligence Analyst, Negotiations Debt Settlement Specialist, Inside Sales Reps and Software Developer. They are willing to train people for the necessary skills, as long as they fit in with the culture. Sheila Coulam graciously thanked all of the day’s speakers, volunteers and job seekers for participating. She encouraged job seekers to take advantage of the many Career Connector services like having your resume reviewed, a free professional portrait and meeting the hiring companies. She also encouraged everyone to view the career blog, which is up and running and has a lot of good career advice. The next event is in Phoenix, Wednesday, May 3rd: “Advancing Your Career with a BEST Company.” Register here. All of us have our own special strengths and weaknesses that influence our career and life. But can you quickly share with someone what your strengths and weaknesses are that define you as an individual? The best thing you can do with your strengths once they have been identified is to own them as described in the article “Owning It: Identifying Your Strengths and Weaknesses” as shared in Prepary, September 07, 2012. • “Look at the other side.” Weaknesses can be turned around into strength and vice versa. • “Don’t be too hard on yourself.” Everyone has weak areas! Lastly, the author reminds us our strengths and weaknesses will always be evolving. As you move forward in your career, not only do you grow and change professionally but also your strengths and weaknesses will adjust and evolve. Embrace the constant evolution and welcome what is to come. Stephanie began her time with the group sharing the story about her kindergartener sharing during his graduation what he wanted to be when he grew up. This little guy boldly told his fellow students, parents and family he wanted to “kill vampires and zombies!” Needless to say, Stephanie and her husband were horrified with their son’s desires. After much reflection and acceptance, Stephanie came to the conclusion her son’s declaration was not far fetched. When you think about it, the vampires and zombies among us are the walking dead and energy suckers in our work environment. 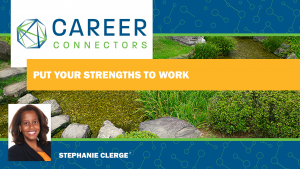 Stephanie like many of us at Career Connectors has also been in career transition. She knows first hand the frustrations and challenges we encounter during this time. In preparing for your career, you need to consider these key strategies. In establishing a strong foundation for career success, we were encouraged to begin in establishing our strengths. According to Gallup, those employees who focus on their strengths are….6 times as likely to be successful in their roles and 3 times as likely to say they have a high quality of life. • What is a Strength? Having a firm understanding of your strengths will….  Make you feel strong.  Identify what you do well.  Show the part of you that is unique and special. According to Gallup STRENGTH is the ability to consistently provide near-perfect performance in a specific activity. TALENTS are naturally recurring patterns of thought, feeling or behavior that can be productively applied. Talent is the foundation for your strengths and basis for achieving your full potential. Skills and knowledge are your investment. Skills are the capacity to perform the fundamental steps of an activity. Knowledge is factual and experiential lessons learned. The final touch is passion. Passion is intrinsic satisfaction or the inherent gratification and positive anticipation. • How do I find my strengths? There are a number of assessment test that will help you discover your strengths. One assessment that is very reliable and free to Career Connector participants is DISC. DISC measures your personality and behavioral style. The assessment will ask you to answer a simple questionnaire about your own behavior. You will be asked to select the word that describes you the most or least. There are no right or wrong answers.  Define your strong career. In preparing for your job search, Stephanie shared with us a few reminders regarding wisdom including: No Road is Easy! Your Strengths help you grow with ease. Learn as you grow! And….. beware of the zombies and vampires in life!!!! Abrazo means embrace and Abrazo Health and its employees strive to help people live happier, healthier lives.. The organization is a leader in healthcare and spans from coast to coast. Abrazo spends approximately 53% of its net revenue on total rewards. Some positions offer a sign on bonus. Current openings include experienced RN’s, Rehab professionals such as Physical Therapists, Director of Nursing, Nursing Manager, Manger of Medical Staff Services, Manager of Clinical Documentation Program, Director of Quality & Risk Management, Computer professionals along with many other healthcare related positions, both clinical and nonclinical. Ajilon is a leader in temporary and permanent placement of Human Resources, Administrative, Supply Chain & Logistics, Non-Clinical Healthcare and Operational Professionals. Parker & Lynch is a leader in Finance and Accounting recruitment. Its focus on people is what sets the organization from others. Job seekers are able to have their resume reviewed, practice interviews and interview prep, competitive salary information, salary and offer negotiation, detailed market information, customized candidate marketing strategy and overall support through the entire hiring practice. Opportunities available at Parker Lynch include Senior Accountant, Sr. Financial Analyst, Controller, CFO, Accounting Manager, and Staff Accountant. Ajilon has openings for HR Generalist, Executive Assistant, Full Cycle Recruiter, Administrative Assistant, Customer Service, Medical Front Office and Logistics Specialist, and Procurement. Ajilon has needs for an Accounting Associate, Payroll Clerk, AP Clerk, AR Clerk, and Medical Biller. The State Farm mission is to help people manage the risks of everyday life, recover from the unexpected and realize their dreams. State Farm is building a 2 million square feet campus in Tempe by ASU and will house 8-10,000 employees. It will consist of four buildings and house varied retail outlets along with restaurants and fitness center. The organization has great benefit offerings including a pension plan and base salary plus commission. A sampling of open opportunities includes entry-level positions such as Claims Associate for Initial Loss Reporting, Express and Interpretation Representative, Customer Care Service and Sales Representative. Bank openings include Bank Supervisor, Loan Processor & Loan Services Representative, Bank Support Rep & Customer Service Rep. Immediate Systems and IT opportunities include Software Developer, Infra Analysts for Malware Tool Support and Tech Support, IT Analyst-Solutions and Bank Technical Analyst. DeAnne extended an invitation to visit the new facility in Marina Heights. Waleed shared with the group the latest unemployment statistics. There are currently approximately 69,000 available jobs in the Phoenix area. The numbers are down a little due to the quickly approaching summer months and election. Opportunities include retail, hotel management, project management and nurses. Some of the top skills being requested are bilingual, quality assurance, IT networking, quality control and IT networking project management. A sampling of hiring employers include Banner Health, Honor Health, CVS Health, Dignity Health, Pizza Hut, United Healthcare, Bank of America, Well Fargo and Oracle. Waleed enlightened us with the different skill development packages offered by the City of Phoenix. Those include Seminars available to the public; Level 1 Package-Skills Match the Job Market; and Level 2 Package-Research Pathways to Higher Wages. Seminars include: Arizona Job Connection (AJC), How to Create a Winning Resume, Perfecting Your Interviewing Skills, Mock Interview Lab, Understanding LinkedIn, Leveraging LinkedIn, 21st Century Job Search Seminar, and Job Clubs. The 3-day sessions are focused on ways to jumpstart your job search. Topics discussed are Social Skills, Creating and Implementing a Job Search Plan, Interviewing, and Long Term Career Management. The 3-hour session emphasizes Employability. For more details on the Skills Development Packages, reach out to Waleed at 602-255-4628 or waleed.alani@phoenix.gov. If interested in a job with the state of Arizona or City of Phoenix please go to Arizona at Work. Dynamic Worldwide will prepare you with an edge in this competitive job market. DWWTC offers programs and certificates in professional development, cyber security programs, advanced cyber security programs and information technology. DWWTC was awarded the 2015 Juniper Platinum Education Partner of the Year for its award winning instruction. The facilities are state of the art and maintain a low student to instructor ratio. Instruction is available on multiple platforms. DWWTC is licensed by the State Board for Private Postsecondary Education; certified through Arizona@Work; and approved for Grant Programs. For more information, please visit the website. Jessica Pierce, Executive Director, Career Connectors, closed the meeting by thanking North Phoenix Baptist Church and the volunteers. The next Career Connectors meeting will be in Scottsdale on Thursday, June 9, 2016 and features Deborah Dubree as speaker for the topic “Up Yours! Up Your Power, Up Your Performance, Up Your Personal Pitch!” For additional information on this event and future events, please visit the website. Career Connectors is 6 years told today! Although Jessica Pierce and her husband were both unemployed at the height of the Great Recession, she felt a need to volunteer her time to others in the same situation by providing resume writing services. That small start grew like wildfire and has evolved into the Career Connectors we know today – and it’s still growing! Jessica says that “bad times lead to good things,” and Career Connectors is proof of that! 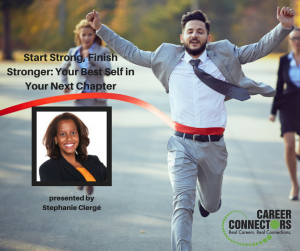 Stephanie Clerge is a coach, trainer and founder of StrengthsPro, producing radical outcomes. She maximizes the unique strengths of each individual on a team, and thereby strengthens the entire team by developing leadership and professional growth. Stephanie started by telling us the story of Bohio’s (her son’s) preschool graduation. Stephanie recalled a question the teachers asked each child as they crossed the graduation stage. “What do you want to be when you grow up?” A doctor, lawyer or even an engineer like his mother and father would have been a great answer. But Bohio answered “I want to kill vampires and zombies!” After a bit of reflection, Stephanie decided that she wanted to do that too—by fixing the walking working dead and energy suckers in workplaces. And that is how her path changed from engineering to becoming a strengths-based leadership and career coach. Stephanie encouraged us to find our path in 3 steps: Know Ourselves, Plan Our Work and Work Our Plan. But how? Where do you start? You start with your strengths. Employees who focus on their strengths are 6 times as likely to be successful in their roles and 3 times as likely to say they have a high quality of life. People who use their strengths are more energetic, engaged, resilient, happier and more confident. Sign your name with your non-dominant hand. Now look at it. Probably pretty ugly since writing with this hand is a weakness; something you’re not confident in doing. Are you going to spend a lot of time trying to write well with your non-dominant hand? Of course not. But this is what we often do with other areas of our lives. We focus on our weaknesses and not our strengths to become even stronger. A strength is what makes you feel strong, gives you energy and comes naturally. It’s what you do well, it’s the part of you that is unique and special and it helps you succeed. It is the ability to provide consistent, near-perfect performance in a specific task. Your talents are naturally recurring patterns of thought, feeling or behavior that can be productively applied—talent is NOT just a behavior. There are various assessment tools that help you with this. As an attendee at Career Connectors, you have free access to the DISC analysis, which helps you define your behavior and strengths. Ease – what comes naturally to you (but is not necessarily easy). Energy – Activities that are your strength give you energy; look for your underlying patterns of thought; feelings and behaviors you’ve productively applied. Excellence – what have you found that you excel at easily? You choose your strong career by considering a 4th E: Experience. Your experiences in your previous positions should give you clues. When did you love: the job/task, the team, manager, culture, industry, learning, commute, travel, benefits? Also think out of the box about non-work or work adjacent activities such as internships, volunteer activities, clubs and hobbies. Knowing these strengths about yourself can help you define where your next position or career could be. Build a strong resume. Tell potential employers what you’re good at and how you complete job tasks and your impact, not just what you did. Work on your LinkedIn profile with the view from a recruiter’s lens. Get your profile as close to 100% as possible, and have a clear, concise (not cheesy) headline. In the summary, tell them your beliefs about your job or industry. Have well written recommendations with details. List a contact email and answer any InMails promptly. And finally, be a part of relevant groups and follow relevant individuals and companies. Develop a list of 3-5 companies you want to work for and research them. This helps you focus your mindset. Get your story straight. Be able to clearly tell your work history story. Your story should include things like where you worked, how you contributed and why you left. Highlight your greatest accomplishment in each role, your strengths and how they help you at work. Have an answer for gaps in employment or other interesting circumstances. And be prepared for behavioral interviews. This type of question starts with “Tell me about a time when…” Have at least 3 stories you can flex for different situations. Work on developing a strengths statement for each of your strengths. Describe a task (a distinct kind of work) that you perform consistently well with satisfaction. Be specific enough to be clear – does it matter why I do this activity? Does it matter what this activity is about? Make it broad enough to apply in many circumstances. Example: My strength is reviewing documentation (data, processes, presentations) written to influence others and providing guidance to make it more compelling. Now that you’ve spent some time getting to know yourself and your strengths, and using tools to further define and develop those strengths into stories, you need to work your plan. Getting a job takes a big plan, so break it down into tiny steps in order to keep yourself and your progress on track. Stephanie offered 6 steps that encompass this process. Write your plans down and incorporate them into your daily life. Only you can do what you can do. No road is easy, but your strengths can help you move along with ease while you learn as you grow. Stephanie’s presentation is available on her website, about half way down this page, under Documents for Work and Life. So – What is Your Plan to Start Strong and Finish Stronger? Jim has been the Phoenix Unemployment Client Advocate since 2000, and gave us some great insights into Unemployment Insurance (UI). UI turned 80 this year. It came about in 1935 as part of the Social Security Act. Although UI is federally funded, each state is allowed to make its own rules. ALL money contributed into the system comes from employers. The higher the number of layoffs, the higher the percentage an employer pays into the system. Employees pay NOTHING into the system. The key word is insurance. Don’t feel badly about filing. Would you feel badly about receiving a payment from your auto insurance after an accident? Your weekly payment is determined by the last 15 months of your income. As mentioned before, each state makes its own rules. With a maximum payout of $240/week, Arizona is #49 in the U.S. It’s not much, but it helps. If you have moved here recently, you may be able to apply for benefits in your previous state. You do not qualify for UI if you quit – you must be separated from your job through no fault of your own. You can work part time while collecting benefits, but what you earn will be deducted from your weekly check. You must be ACTIVELY seeking work while you collect. You must file weekly claims with proof of your search. Enthusiasm is ALWAYS noticed, so make sure you have plenty during your job search. ALL information is online – it is a very robust website. Go to www.azui.com and select Apply for UI Benefits. DHL is an international shipping and delivery corporation. They are in over 200 countries (and growing) and are the number one international express service. The call center in Tempe is growing into a new building and moving from Priest and Washington into a new building across the street on Rio Salado Parkway. Every person who works for DHL receives a week of paid training and becomes a Certified International Specialist. Benefits include medical/dental, 401k, tuition reimbursements, an on-site gym and many career advancement opportunities. Available positions include front line customer service and direct channel (inside) sales. Apply online here. The state employs approximately 35,000 people in over 100 agencies, boards and commissions. In 2016, fully 25% of State workers will be retirement eligible. So now is a great time to join the State! Benefits include 10 paid holidays, liberal sick/vacation time, disability insurance, 11% retirement match, exceptionally low healthcare premiums, dental, and vision, life and training opportunities. You MUST apply on-line. The majority of the agencies use the azstatejobs.gov website. Although you must follow the website instructions, Jan emphasized that it is important to differentiate yourself when possible. Current open positions range from HR Generalist to Investigator to Senior Paralegal. Positions change often so check the application website. Mountain Vista Medical Center is a 178 bed acute care facility and full service hospital. They recently celebrated their 8th anniversary at Crimson and Southern in Mesa. Current available positions include case managers, RNs, diet technician, department secretary, cooks and medical technologists. Apply here. EDMC is composed of The Art Institute, Argosy University, Western State College of Law (as part of Argosy), Brown Mackie College and South University. Student success is the strongest value at EDMC and the culture of education and success extends to the employees as well. Open positions include Administration Reps, Academic Counselors and Admission Managers. There are also many other positions available in other locations outside of Phoenix. Benefits include PTO, 401K, health and dental insurance as well as short/long term insurance and a generous tuition program. Find open positions and apply here.